Story and photo by Janice Christensen David Peyton and Kasha Sanderson aren’t from here, but they’re Riverwesters now. “We just bought a house on Pierce Street,” Kasha says. “We moved from Fratney.” It turns out they bought the house owned by former Riverwest Currents writer Valerie Valentine and her husband. “It’s a beautiful house,” David says. The yard is full of raised beds where they grew tomatoes, peppers, basil, lettuce, spinach, radishes, and carrots this summer. 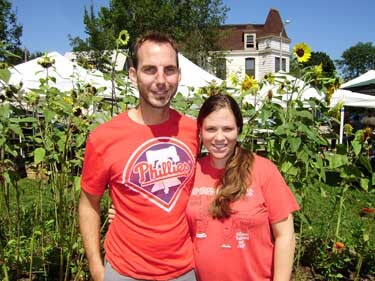 David and Kasha first moved to Riverwest in 2008, “…because we liked the neighborhood.” They moved here from Shorewood, and before that they lived in Aberdeen, South Dakota. Kasha grew up in Chamberlain, South Dakota. She met David when they were both students at Northern State University in Aberdeen. David’s from Newark, Delaware. “That’s pronounced New Ark,” he emphasized. “Newark’s in New Jersey.” Right, got it. David did his undergraduate work at Wilmington in Delaware. He graduated in 2001 and moved to South Dakota for graduate school. He was a graduate assistant for the education program and specialized in secondary education with an emphasis on social sciences. He received his master’s degree in 2004. Kasha was studying elementary education with emphasis on early childhood at Aberdeen. She graduated in 2004. “My mom, dad, and sister are all teachers” Kasha explained. “I didn’t know what else to do, so I went into education too. Then I took a semester off and got a job in a nursing home. Turns out I loved it.” She’s been working in the health care field ever since. After he got his degree David worked at the university in Aberdeen until 2006. He was a research assistant for the literacy program and taught in the education department. Then the couple moved to Milwaukee so David could study for his Special Education certification at UWM. He worked in a program that offered a temporary “emergency” certification from the Wisconsin Department of Education so he could take on a two-year commitment in a teaching position while he worked on his certification. He started at the Milwaukee Academy of Aviation Science and Technology, a choice school that had some troubles and is no longer in existence. After a year there he transferred to Waukesha North High School. He’s still there, working in their special education program and teaching American History. “I got into education after working for a bank for a couple of years” David recalled. “I didn’t like the vibe of the bank much, but it got me interested in how society functions. I thought teaching social sciences might help reshape society, if people could start thinking about how society functions at a younger age.” Kasha worked in home health care and hospice work while the couple still lived in Aberdeen. When they moved to Milwaukee she decided to go back to school at Cardinal Stritch for a nursing degree. “We made good use of the student loan program,” David laughs. They like Riverwest. “It has a very eclectic group of people,” Kasha says. “There’s a real community feel. People still talk to each other.” “It’s not a suburb,” David chimes in. “We’ve had great neighbors both places we’ve lived in Riverwest.” Winter is coming, and it will bring some changes to the Sanderson-Peyton household. “We’re expecting a baby in December,” David smiles. “We know that will make some changes,” says Kasha, “and we’re not quite sure yet what they will be.” But they’ll be ready. They picked bushels of tomatoes at Woody’s in Cedarburg. “Ninety-six quarts of tomato sauce!” says Kasha proudly. That should get them through even a Wisconsin winter.